We think that this year's Halloween Events have been our best ever! But wait, theres more! These Halloween themed Contact Lenses are now restocking!! Halloween wouldn't be complete without a Thriller Jacket! Now on sale at the Pirate Ship. The Tanning Salon has added over 200 new skin colours! Can you find the Pumkitty Hidden Avatar? The Digital Fairy has just been released! The Digital Fairy is a massive geek. Living in Ziranek, she is years ahead of the rest of us with technology. She is such a good hacker and programmer that some say that Marapets would be run better by her! She gives you these prizes for free for collecting Hidden Avatars. You can currently receive prizes for having up to 725 or more Hidden Avatars collected! The Digital Fairy has been added to the Ziranek map. Can you find the Digital Fairy Hidden Avatar? The Chibs is the latest pet to wear the Hairy Costume. These new items are now restocking. The new Moustache Book and Witch Wig have been added to the Pirate Ship. The Lottery has been drawn for this week. jadamary is the winner of the 187,700MP Jackpot with the winning numbers of 1, 3, 5, 7, 4 and 8! Congratulations! Last Week's Raffle has now ended. magpie24 is the winner of the Red DNA and 100,000MP prize with the winning raffle ticket number 6452! Congratulations! Make sure you buy your tickets for today's raffle - only 10MP per ticket! The Game of the Week has now changed to Shoot the Fatty. Can you find these Hidden Avatars? These new Rainbow Fairy Prizes have been added. You can now receive prizes for up to 1,000 Pet Transformations. The final event of our Halloween Celebrations has just started! It will end on November 4th. To take part in Character Trick or Treat, all you need to do is dress your character up in a Halloween Character Costume. Then you can visit the profile of any player that is currently online, hit the Trick or Treat button and get a prize! You can only Trick or Treat each person once and you will receive MP or an item. All of these item prizes will retire at the end of this event too! If you are dressed up really well for halloween, you might even scare the other player so bad that their character has to walk around the site looking terrified! You tricked Ian and look how scared he is!!! The Pirate Basil, Minipet Lati and Musical Azul have just been released. You may also find the Healthy Treat hidden avatar! Three new Pet Colours have been released. The Sketch Murfin, Dark Fairy Yuni and Wizard Murfin. Can you find the new Hidden Avatars? Dr Yekyll has created a new DNA Minipet in his lab. The Figaro and Troit can now be cloned to make a Trigaro. The Zombie Azul has been revamped. We have also released a new Sleepy Yuni and Old Justin. The Obese Fairy has added these new costumes for those who really do spoil their pets with Gourmet Foods. These new limited edition Account Upgrades items have been added for Halloween. They will all retire by November 5th. The 2012 Pumpkin Hunt will start tomorrow! These new Midnight Gonk and Halloween Oglue pets have also been released. A new Pumpkin Hunt has just started for 2012! It will end November 2nd. As you browse and play the site as normal, check out every page for a Pumpkin in a box. When you find it, click it and you'll get a prize! The 250 different players who collect the most pumpkins will receive 1,000,000MP and a limited edition Pumpkin Ghost Trading Card and the next 250 will get a limited edition Pumpkin Ghost Trading Card! 10 lucky players who have collected more than 100 pumpkins will also be randomly selected to win a retired Halloween Costume!!! WARNING : Anyone caught adding fake pumpkins to their profile, signatures, clubs or anywhere else on the site will have their account frozen for the rest of Halloween and be fined for doing so. 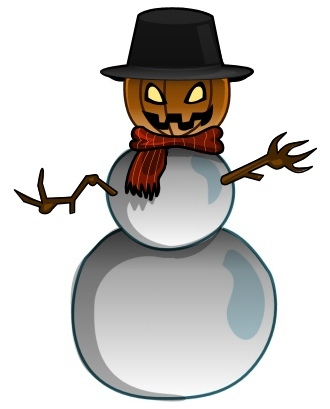 You may also find this Pumpkin Hunt 2012 hidden avatar! 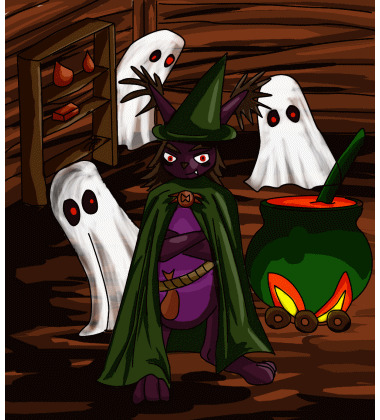 Halloween Week continues with these new Pet Colours - Halloween Chibs, Ghost Azul and Witch Justin. Can you find the new 'Obey' Hidden Avatar? The Snowman has taken halloween a little too seriously again this year! He is now only asking for Halloween Treats and he is giving out some new prizes! All of these prizes will retire at the end of the Halloween 2012 Events! The Ian minipet is the first to be able to wear the Ball of Halloween Yarn! This new Headless Costume has been added to the Guillotine. Visit the Decapitating Fairy today for your chance to get hold of one. Its time to celebrate Halloween in the world of Undying Woods! Elger has taken the time off from doing quests during this holiday season. Instead, you can visit her with your pet dressed up for Halloween to go Trick or Treating for FREE once every 20 minutes - Hairy pets can visit once every 15 minutes! All you need to take part is a pet wearing a Halloween, Mad Scientist, Nefarious, Hairy, Skeleton, Ghost, Witch, Dark, Zombie, Wizard, Voodoo, Vampire, Goblin, Rotten, Midnight, Insideout, Gothic, Eleka, Killer, Headless, Mutant, Mad Scientist, Werewolf or Devil costume! Nine new Halloween Treats are now restocking. The Elite Gym has just started FREE TRAINING for all pets wearing Halloween, Mad Scientist, Nefarious, Hairy, Skeleton, Ghost, Witch, Dark, Zombie, Wizard, Voodoo, Vampire, Goblin, Rotten, Midnight, Insideout, Gothic, Eleka, Killer, Headless, Mutant, Mad Scientist, Werewolf or Devil costume! These new Pet Colours have been added. The Angel Oglue, Splatter Osafo and Insideout Tasi. Halloween Week has just started! We have SO much happening from now until November 1st, including Character Trick or Treat, Pumpkin Hunts, the Halloween Snowman, limited edition Account Upgrade items and Elger's Trick or Treat! Are you ready?? These new Candy Apples are now restocking in the Candy Shop. The Gym has just started FREE TRAINING for all pets wearing Halloween, Mad Scientist, Nefarious, Hairy, Skeleton, Ghost, Witch, Dark, Zombie, Wizard, Voodoo, Vampire, Goblin, Rotten, Midnight, Insideout, Gothic, Eleka, Killer, Headless, Mutant, Mad Scientist, Werewolf or Devil costume! These new Pet Colours have been added. The Midnight Lati, Devil Willa and Halloween Yuni are perfect for Halloween 2012! The Gonk pet has had a revamp. The missing, basic Gonk colours have also now been added. The Lottery has been drawn for this week. TwlightQueen is the winner of the 324,800MP Jackpot with the winning numbers of 2, 4, 8, 9, 15 and 21! Congratulations! Last Week's Raffle has now ended. Wildflowered is the winner of the Red DNA and 100,000MP prize with the winning raffle ticket number 2964! Congratulations! Make sure you buy your tickets for today's raffle - only 10MP per ticket! Well its nearly Halloween and things are starting to get spooky around Marada. We're not sure where he came from but there seems to be a halloween devil running around! He calls himself Beelzebub and he has all sorts of halloween goodies to give away to members who have a halloween-themed character or profile - mostly small things but a few lucky members might get a rare costume or a limited edition pet! Dont worry if you dont have a halloween costume for your character, you dont need one - just use your imagination and grab yourself some appropriate clothes and makeup to make yourself look appropriately spooky - creativity is more important than the expense of a costume! Although this is mostly a forums-based event, there will also be prizes rewarded randomly to members who are online and have something spooky about their profile, so you may still win something even if you dont have forum access. These new Chibs Gummies are now restocking in the Candy Shop. These new pet colours have been released. The Bee Crindol, Halloween Gobble, Light Vixen and Halloween Zoink. Halloween Events will start shortly and the 2012 Undying Festival will start when Halloween is over! YAY! These new Obese Fairy prizes have been added. You can now receive prizes for up to 950 Gourmet Foods. A new Missing Transformations Giftbox has been added to the Account Upgrades page. It will list the missing transformations your pet needs - useful for those working on the Rainbow Fairy challenge. These super cute new Willa Plushies have been added to the new Enchanted Plushie Machine. These new King Baspinar Loyalty Prizes have been added. You can now receive prizes up 75 months. A new Toy Account Upgrade has just been released. You will receive a pearl, plushie, book, ball of yarn, trading card, costume and 7 random pieces of the Enchanted Plushie Instructions. The Ian, Jokemo and Spooks are the first minipets that can wear the Ball of Toy Yarn. We have just added an Enchanted Plushie Machine to Slater Park. You will need to complete the Enchanted Plushie Instructions for lifetime access. With access you can use it for FREE once every 30 minutes. Filled with Plushies and Enchanted Plushies, it gives you more chance to get hold of the plushies you need for your collections. There is also a greater chance of grabbing an Enchanted Plushie. It also will have unique plushies only avaliable from this machine, and if you are really, really lucky you may grab a restricted pet enchanted plushie!! The Enchanted Plushie Instructions will be part of the October Account Upgrades. The Daisy pet has been revamped! The missing, basic Daisy colours have also now been added. The Lottery has been drawn for this week. tommcat is the winner of the 466,900MP Jackpot with the winning numbers of 3, 25, 1, 23, 7 and 20! Congratulations! Last Week's Raffle has now ended. Luvmeluvr is the winner of the Red DNA and 100,000MP prize with the winning raffle ticket number 1460! Congratulations! Make sure you buy your tickets for today's raffle - only 10MP per ticket! The Lottery has been drawn for this week. Piano_Lady is the winner of the 82,100MP Jackpot with the winning numbers of 5, 22, 7, 9, 17 and 2! Congratulations! Last Week's Raffle has now ended. MirellaMystic is the winner of the Red DNA and 100,000MP prize with the winning raffle ticket number 627! Congratulations! Make sure you buy your tickets for today's raffle - only 10MP per ticket! The Game of the Week has now changed to Leido Bounce.